"The orang-utan (Pongo pygmaeus) is the only existing Asian representative of the so-called great apes. Although in prehistoric times there were orang-utans on the Asian mainland, today they are found in just a few restricted areas of the islands of Borneo and Sumatra. Orang-utans diverged from the other apes between 16 million and 10 million years ago. One of their recent ancestors was the largest known primate, called Gigantopithecus blacki. This species is estimated to have weighed up to 300 kilograms (about 660 pounds), and it lived in Asia during the Pleistocene epoch, one to two million years ago. 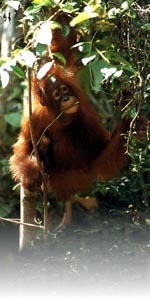 Compared to Asia's lesser apes, the orang-utan is one of the slowest land mammals on the continent. Orang-utans can speed up when suitably motivated - panicked individuals may even leap across small gaps in the trees - but this happens only occasionally. Life is generally very unhurried for orang-utans. Orang-utans are described as having four hands, rather than four feet. They tend to use their arms to grip branches rather than standing on branches for support. They move their arms and legs in whatever order circumstances dictate, being equally at home hanging sloth-like under a branch or spreading their weight over several slender supports. The reproductive rate of female orang-utans is very slow, with new young being born every 4-5 years, or even as long as 8-9 years. This means that in a female's reproductive life time she may only produce three or four offspring. The youngster is solely dependent on its mother until her next baby is born. 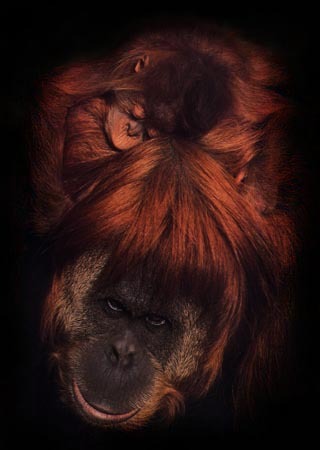 Compared with other apes, orang-utans are fairly unsociable creatures and the only real bond that is formed is between mother and offspring. The young stay with their mother until adolescence at about the age of seven, but after that they generally only see each other from time to time. The males move away in search of their own territories. Males travel long distances, paying little attention to other orang-utans that they meet. When the males become sexually mature they develop many distinctive physical features that are very characteristic of orang-utans. Fleshy cheek pads form on both sides of their face and a high, fatty crown on their head. Their hair grows long and a beard develops on their faces. They have an impressive call that they produce with the aid of their laryngeal sac (found hanging from their chin). The call is thought to be a mating call, but little is known yet about its exact purpose. One of the most outstanding features of orang-utans is their ability not only to remember where all the desirable fruit trees are, but to know exactly when each fruit type will be at its ripest. Flowering and fruiting occur over a huge area and in such an irregular fashion that humans are baffled by the orang-utans ability to recall each tree's destination. To the orang-utans it is second nature. The orang-utan's diet consists of fruit, young leaves, bark, flowers, insects and birds' eggs. During the winter season the scarcity of fruit leads to the consumption of their less favoured foods. The more persistent and hardy individual has even been known to brave a bees' nest to acquire a tasty handful of honeycomb. During the warmer seasons orang-utans primarily eat fruit, their favourites being figs, durians, ramburans and mangosteems. These fruits are rare and widely distributed which in turn leads to a dispersed population (and the associated lack of social graces). Orang-utans are one of the least understood of all apes, and are continually under threat from the actions of man. The problem is not now primarily from the illegal capture and trade of orang-utan young, but due to the ever-depleting habitat caused by the extensive logging of their forest homes."